Prosecutors in Japan have indicted former Nissan chairman Carlos Ghosn with two fresh charges involving financial crimes. The new charges will likely keep the 64-year-old in prison until his first trial, according to his lawyers. Mr Ghosn was first charged last year with underreporting his pay package for the five years to 2015. On Friday, a fresh charge claimed he understated his compensation for another three years. He was also indicted on a new, more serious charge of breach of trust. 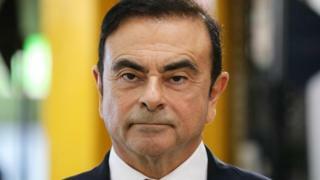 Mr Ghosn, the architect of the Renault-Nissan alliance, is accused of moving personal investment losses worth 1.85bn yen (£13.4m; $17m) racked up on foreign exchange dealings to Nissan. Mr Ghosn is also accused of making $14.7m in payments to Saudi businessman Khaled al-Juffali, using Nissan funds in exchange for arranging a letter of credit to help with his investment losses. He was first detained on 19 November and rearrested twice in December. Following his arrest, Nissan and Mitsubishi removed Mr Ghosn as chairman. Renault has kept him on as chair, saying it has not yet found any evidence of wrongdoing. On Thursday, the board of the French firm said an investigation into executive pay had so far shown no signs of fraud. “The review process has examined the compensation of the current Groupe Renault Executive Committee members for the financial years 2017 and 2018 and has concluded that it is both in compliance with applicable laws and free from any fraud,” it said in a statement. It said the review process “will continue with respect to previous financial years”.